Technology belongs to everyone, so it saddens me when I see how few girls study the subject. At the University of Buenos Aires (where I will begin my degree later this year), only 11% of computer science students are women. This is unacceptable. It can be challenging breaking into a field where you don’t feel welcome. I remember feeling ashamed in my computer studies class that I was getting the best grades — it wasn’t expected that a female student would enjoy or excel in the subject. I remember how lonely I felt the following year when joined a class to learn the programming language Python and I was the only girl there. My Chicas Programadoras classes are about encouraging girls to experiment and try new things. I want the girls I work with to be able to go home happy with what they learned. I want them to continue to study and explore the subject on their own. I want them to know that there is a group of women programmers that will always be there to guide them and answer their questions. 1. It’s not difficult. A classic stereotype of programming is that you need to know a lot of mathematics and be a genius to be able to program. That’s not true. Even with basic concepts, you can create great things, like mobile games and apps. 3. It’s fun. The previous point relates to this one — when there is so much to learn, it’s hard to get bored! It's wonderful to create things through a combination of colorful words and see how they work. Programming is fun. Once you start, you’ll probably stay up late trying to capture your thoughts in the language of the machines before going to sleep. For example, some months ago I worked on this project of making a speech detector and modified it so that every time somebody said the word “unicorn,” a random image of one would pop up! Totally worth it, in my opinion. 4. You’re not alone. One of the things that surprised me the most when I started programming was that I found a community at Clubes de Chicas Programadoras. I had the opportunity to interact with girls who went through experiences similar to mine, who were my same age and with whom I shared a variety of interests — in addition to our enthusiasm for technology. I felt comfortable to learn what I liked. 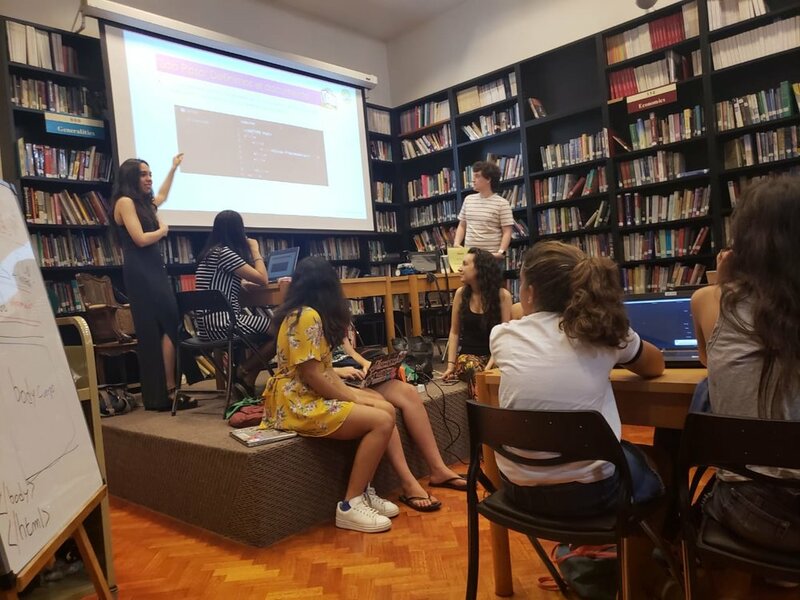 Meeting professional women in the field of computer science — like Karen Roberts, a computer engineer and professor at the University of Buenos Aires and Marisabel Rodriguez, an electronic engineer — helped me choose my path and gave me confidence for my future. They encouraged me to continue studying this subject despite the adversities and they inspired me with their stories. I know now I can still go to them anytime I have questions or need help in solving a problem. 5. You will expand your world and learn to think in a different way. I discovered that the world is much bigger than I thought. When you are programming, there’s never an "impossible." There’s just something that was not solved by another person yet. You have to find the right tools to create it — or, if you do not have them, create the tools yourself. Technology is magical. It allows us to quickly solve the small — and big — problems of modern life. It’s collaborative as there will always be someone willing to give you a hand. It’s an art, which begins as a sketch and ends up being work admired by millions. This piece is available in Spanish. Camila Codina is a 17-year-old student from Buenos Aires, Argentina. She’s a tutor at Chicas Programadoras and will soon study computer engineering at the University of Buenos Aires. She has a cat called after a programming language, Java.